It's such a pain. Sure, my spamfilter catches it all, but it takes time and I'm fed up of coming home from work to nearly ninety emails. My setting's quite aggressive at 4.0 but when most is rated 20 to 30 it doesn't make much of a difference. My brother couldn't get a taxi in time, so he asked me to give his girlfriend a lift to the train station this evening. I wouldn't mind, but I'm low on petrol, and by the time I'd dropped her off the petrol station at Safeways was closed, and I couldn't be bothered to try anywhere else. So I suspect I'll head over tomorrow, fill up with petrol, then cook dinner at my parents (my mum said there's some chicken in the fridge that goes off on the first, and my brother's vegetarian so he won't have it. Maybe I'll share some with Gizmo, the cat who's always asleep in the bush by our front door. He is cute though. My brother took a couple photos recently. Got to hear about Helen tonight from Kev. Yippy. She doesn't care about me and never replies so why do I have to listen about her. She's running the 10,000 so hopefully she'll do well, plus it's more money on celebdaq. Also the name of a track by Prodigy (there's no "The", I should have remembered that) on the new album. They confuse me (girls, not Prodigy), at least Helen seems to be fairly vague as to whether she likes me or not. I'll just play it by ear I think. Helen from uni, Kev's friend, appears to have taken me off both her MSN accounts too, so she's off mine now (yes, it might sound petty, but she hasn't repled to my text messages either so what's the point of keeping her on?). I was going to try and have an early night tonight, but I may mix some music for a CD to take into work instead. Much more fun. Listening to The Prodigy, while I shaved off my beard and had a shower. Lynne finally came online, got to chat to her again very briefly. Was nice to know she's still alive though. Haven't heard any news about Caz, she's not too healthy at the moment, hoping she'll text me back sometime. The women's pole vault last night was really exciting to watch, a new world record of 4.91 was pretty good too. Watched Resident Evil, pretty good, tense, stylish thriller, but the dialogue was short and cheesy. Still, I wonder what the sequel will be like and how it'll continue from the first. Really didn't want to go to work today, and once i was there it wasn't too exciting either. Was nice to see her do well yesterday. She's also quite attractive. Molly, one of the cats in my parents' close, tried to kill herself by running in front of my car again last night. Silly thing. My beard had a white hair in it, I hadn't noticed, but my family did so it's gone now, along with a brown one next to it. Ouch. I watch The Princess Diaries this lunchtime, Anne Hathaway is in it, she plays a 15 year old. She still looked hot and cute in it though. She was born in November 1982 so she's a year younger than me (making her 21). So she would have been 18 when TPD was made, so I feel quite relieved now! I can't wait to see TPD 2, it should be out soon. I've given up watching Cat In The Hat, it's very hard to watch, perhaps because it's trying to constantly capture the viewer's attention. It looks like the squirrel Katie was on about is Twiggy. 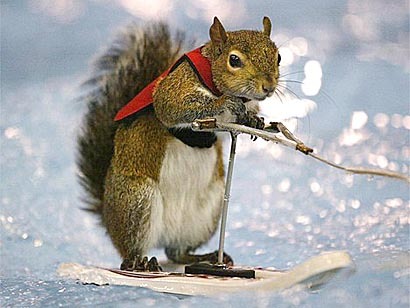 "There is a water ski-ing squirrel in the daily mail." She's so lovely. I just watched Ella Enchanted, but she's in The Princess Diaries too. I seem to have accidentally grown a beard without having thought about it too much. Helen from my office (and not the one I asked out, nor the one I'm meeting next week, nor Kev's friend from uni) said it suits me. I was going to shave it off sometime, but I think I'll keep it until no one recognises me. I watched Super Size Me last night, it was pretty good, and full of useful information, which I might mention later when I've finished watching TV. According to the United States Census, Morrison lived in the town of Christiansburg and worked as a pharmacy clerk. In that same census on the next page (if I remember correctly) is another Dr. Pepper and he has a daughter, Malinda or Malissa, who is only 16 to Morrison's 17. If you understand that the census takers walked from house to house, you can tell they were near neighbors. This makes much more sense to me than Dr. Charles T. Pepper, 40 miles away in Rural Retreat. It's very likely that Morrison named the drink after a completely different Dr. Pepper of Christianburg, Virginia, and that this Pepper's daughter was the one whom Morrison had been in love with all those years ago. One thing I've noticed about Trish's piano playing is that pretty much every time she makes a mistake she makes a tutting sound. And she seems to be making a lot of mistakes, as I think she's learning a new piece. And I got a nice text back from Katie, not only did she not think I was mad, she also loves squirrels. When she was little she had a little white one come into her garden. Her parents are away this week so she has the house to herself. Lucky her. Oh yeah, we managed to fit it last night, my dad did a great job, didn't even break any tiles as he drilled the hole through. She seems to be doing a good job of ignoring me, if that's what she's trying to do. It's been over three weeks since she got back from holiday, and not only have I not visited her, but I haven't gotten more than a dozen words out of her. I'm tempted just to shut her out of my life, if that's how she's going to treat me. I hate being messed around. Damn, I had a nosebleed in the shower, it's always hard to stop them as you don't want to get blood everywhere, and all the tissues get damp until you've dried off. And you don't want to go too slowly, or you'll be late for work. I don't want to go to work this morning!! I really don't enjoy my job. Still, maybe I'll make it in for 10, stare at the screen for a few hours, write a few emails that no one ever reply to, and copy and paste a few files. Maybe I just need to take a week off work sometime. Or perhaps just find myself a new job. I caught the start of the opening ceremony, watching people walk around in circles is hardly riveting TV. Still, it was nice to see Leon get our first medal me the games, silver is very impressive. Having trouble fitting the washing machine in the kitchen, may get it done eventually. Lynne's spent this weekend in Bristol so I've been unable to chat yet again. It's getting very annoying now. I'm looking forward to having a lie in tomorrow morning. I'm hoping some sleep might put me in a better mood this weekend. I'm feeling down again. Work's not only incredibly boring, we're also running out of stuff to do. I spent two hours doing nothing at lunchtime. I tried asking out Helen at work, but she just seemed to pretend I never said anything. This job in Bristol I was excited about looks like a risky move so I probably won't take it. So I'm stuck with boring work, but at least I can pay the rent. The usual person to cheer me up is Lynne, but she's been impossible to contact. The engineer has arrived early and is sorting out everything, I'll be online soon, and have a landline and digital TV! Also getting the washing machine sometime this afternoon. Took the day off work, feeling good, but would have been nice to email my friends on the intranet. I'm watching it with Kev tonight, quite funny and entertaining, and has Jennifer Love Hewitt in it. Had the flat to myself tonight. Was hoping some friends would reply to my text messages from yesterday. Lynne didn't answer either. Getting fed up with some of my friends. Job is also boring, nearly finished the interesting bit. Been emailing Helen at work a lot, but even they've died down from her. Not sure if she's interested in me or not, probably not. Bit of a bad evening really, will hopefully cheer up tomorrow. Stuart has left the house! He looks a little drunk. Will have to eat later tonight when Gareth and Trish get back from shopping with matches or some kind of way to light our gas cooker. The battery has probably gone, but we can't replace it, will need to contact the landlord sometime. Finally starting to feel like a home and not some building I'm paying a fortune to store my things in. Weather is terrible, so won't be visiting parents tonight. Maria and Gareth should be over later though. I'm in the new flat now, still a few things to collect tomorrow like some mugs and plants. I thought I'd locked myself in the bathroom tonight, but after calling for help through the door, Trish explained how the door just needs to be pulled hard to let you out. Work soon, wish the weekend was longer.